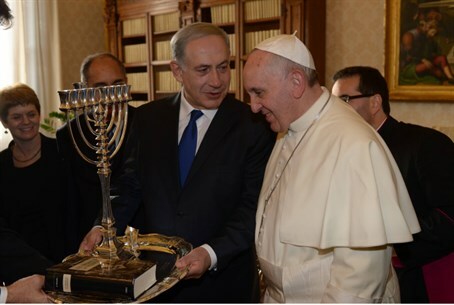 Pope Francis is due to arrive in Israel on May 25, but Councilman Aryeh King has made clear that he will not be among the Jerusalem officials welcoming the Catholic leader. Jerusalem Mayor Nir Barkat is expected to greet the Pope on Mount Scopus during the visit, and Barkat's office has sent messages to members of the city council inviting them to join in welcoming the Pope. King, chairman of the "United Jerusalem" faction, responded by mail to Barkat's office and the other council members, declaring that he will not join them. King has likewise been actively opposing the rumored negotiations that would have Israel sell King David's Tomb to the Vatican. Foreign Minister Avigdor Liberman denied the deal on Tuesday, after hundreds of Jews protested at the site the day before. Last month, an Israeli diplomatic source told Arutz Sheva that the Israeli government has no intention of transferring control over the site to the Church; those claims were reiterated Sunday, by the office of the Sephardi Chief Rabbi, Rabbi Yitzhak Yosef.